Completely Customizable Grilles and Architectural Panels. We’ve been spending the Winter playing with our newest toy that can take completely custom designs and accurately cut them into a variety of materials such as wood, acrylic, ABS, etc. 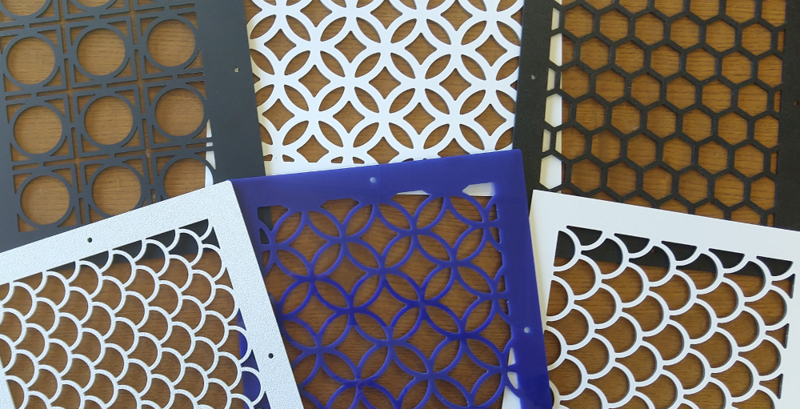 We will be adding new custom grille design pages to our website to allow customization of dozens of designs, colors, materials and textures to the exact size you need, plus we will be able to create completely one of a kind products from designs you can submit. Looking for a unique round grille? Have a design you would like cut into an architectural panel? Need UV resistant materials for external vents or garden trellises? Send your designs to sales@hvacquick.com for a quote.